All your favorite candies in one bag! 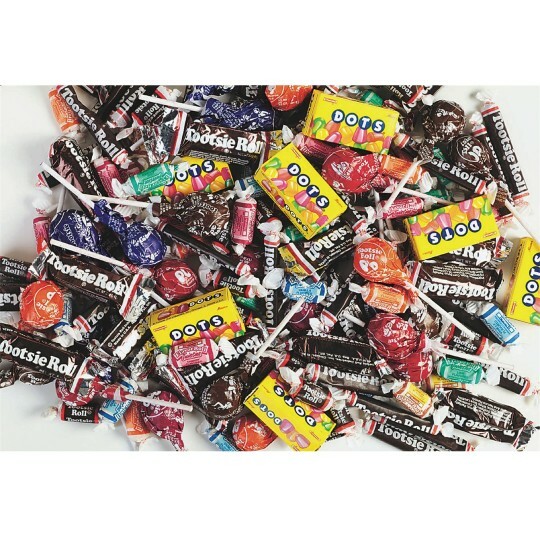 3.5-lb assortment includes original and assorted flavor Tootsie Rolls, Tootsie Pops and Dots. Approximately 135 pieces per bag. 3-1/2 lb. assortment includes original and assorted flavor Tootsie Rolls, Tootsie Pops and Dots. THE CANDY SELECTION IS GREAT SOMETHING FOR EVERYONE!!! I USE IT FOR CANDY PRIZES AT BINGO FOR MY RESIDENTS AND KEEP IN A BIG BOWL IN MY OFFICE FOR MY FELLOW COWORKERS TO ENJOY WHEN THEY VISIT THE ACTIVITY DEPARTMENT!!! THE PRICE IS RIGHT AND KEEPS EVERYONE SWEET!!!! Lots of variety. Great to be able to get it all in one place! Filled a large pinata!! Lots of fun! !